On the 8th and 15th of September 2017 Trewon participated as a vendor at two Quantico Hiring Events hosted by the Career Resource Management Center at MCB Quantico that are regularly held at the U.S. Marine Corps Base in Quantico, Virginia. These events help veterans and their spouses reach their own personal and professional goals while they also provide a venue for employers to reach out to highly skilled personnel. Rebecca Pere’, Trewon’s recruitment manager, set up a display of our work at these two events, with the one held on the 15th drawing upwards of a few hundred military members and spouses. She talked one-on-one with visitors to our table on the cutting edge work Trewon does in IT for its federal and business clients. After spending several hours at each event speaking with service men and women and learning about their IT skills, rigorous training, and experience, Rebecca walked away more convinced than ever that there is a rich pool of candidates in our Armed Services. 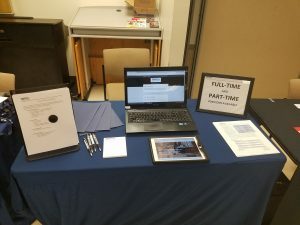 It was equally exciting for Trewon to see how the work experience and skill set of the veterans attending the job fairs meshed so well with the IT work we do in supporting the needs of our clients. Visitors to our table welcomed hearing about our vision as a company, our role in the community, and the company’s commitment to professional development and growth. Needless to say, Trewon’s excellent benefits package and competitive salaries were also of interest. Trewon looks forward to participating at the next job fair at Quantico in November 2017. We expect it will be as rewarding an experience as it was this month!